The Secret To Easing Your Senior Pet's PainFree and Easy Movement for the Animal Friend you Love Do you remember what it was like to play with your happy puppy or kitten free of pain or the joint restrictions that come with age? With Super Pet Joint Aide you have the power to help them recapture those feelings. - Unique Biopet formula makes Super Pet Joint Aide much more effective than Dasuquin at a lower cost to you- Glucosamine will help lubricate the joints and give your pet free easy movement. - Manganese will support bone strength and blood flow for continued healing. - MSM is used to reduce inflammation and aide the rebuilding of tissue and address skin disoeders. With Super Pet Joint Aide's unique Bio Pet formula you know that every penny will count towards your pet's healing. - Veterinarian recommended, high grade, and Made in the USA! With all the devastating side effects reported about unregulated foreign supplements it is more important than ever to know you're giving your pet a high quality regulated health aide. - Easy to control dosage! With our large 120 tablet bottles you can easily increase or decrease dosage as needed to find the right level for your unique pet's healing and recovery process moving forward and makes this supplement ideal for multi pet households - The ONLY Fully Guaranteed pet joint supplement! If you follow the recommended dosage and don't notice a difference in your dog or cat within 60 days we will give you a full refund! 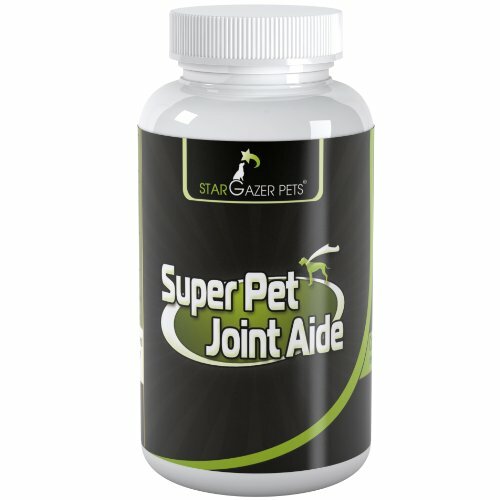 Add Super Pet Joint Aide to your cart and check out right away to enjoy the freedom and relief Super Pet Joint Aide will give you and your Super Pet now!